I had the chance to spend a few hours over three days on the Yellow Breeches in PA this past week as I had been invited to give two lectures at Messiah College. I left early in the morning the day before the lectures so that I could spend a few afternoon hours on the Breeches. When I arrived I went to the TCO shop in Boiling Springs to talk to Neil about what was going on and to firm up our plans to spend an afternoon on the Letort (more on that later). I would highly recommend this shop if you are in the area. It is well stocked and the staff are very friendly and helpful. The afternoon I arrived the Breeches was high and discolored from rain the previous day so I fished “The Run”. There were a lot of fisherman on the lake, but I had The Run to myself. 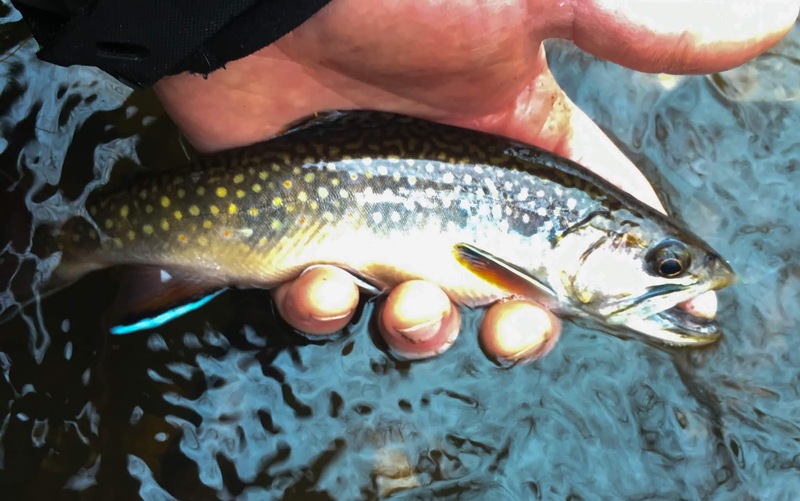 A mix of stocked rainbows, browns, and a couple of very colorful brook trout were brought to the net using small flashback PT's, copper-beaded PT soft hackles, gold-beaded hare's ear soft hackles, and olive Lafontaine caddis pupas. It was a wonderfully warm and bright day to be outside and the fishing was great. In contrast to the previous afternoon, the following morning was a rainy, raw, and cold. 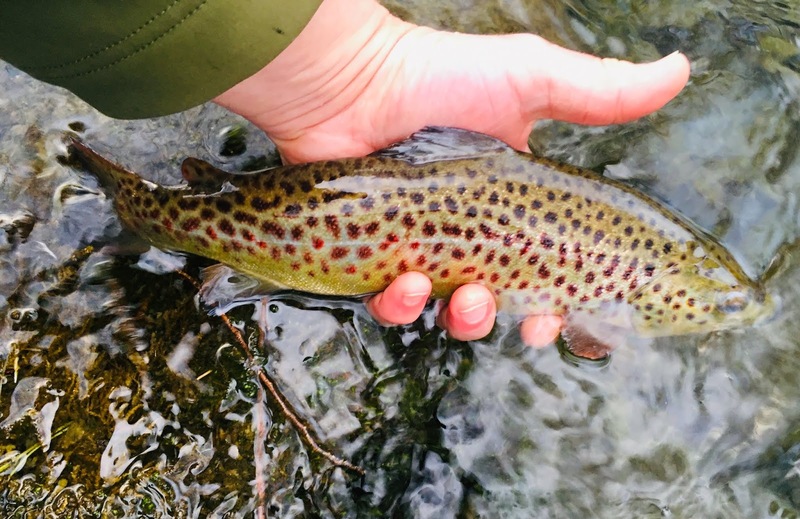 However, as soon as the rain showers started the fishing really heated up. I shared The Run with a Blue Heron that had obviously found a good source of fish based on the number of I caught with scars on their backs. It was a fantastic couple of hours, nymphing the shallow riffles before I needed to head off to meet some students and prepare for the lectures. On my last morning in the area, Neil had provided a couple other areas on the Breeches to check out which I was very grateful for. When I took a quick glance at the river early the next morning, it still high and off-color to me, so I figured I would fish "The Run" again before our afternoon on the Letort. 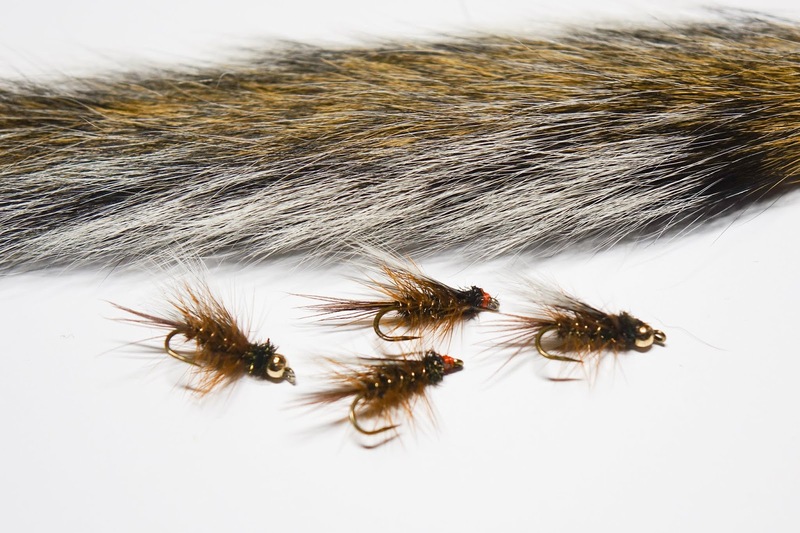 I had to adjust to smaller flies this particular morning since the flies that had worked previously were not of interest to the fish. 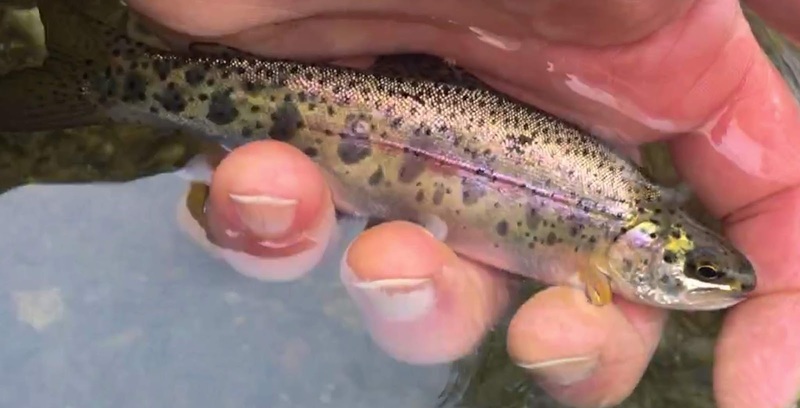 I could spot fish sitting in the shallow riffles, and from their movements it looked like they were feeding so I downsized to a #18 flashback PT and an olive zebra midge. This was the best morning of my trip since I was able to really dial in my small nymphing game. The fish were very quick and the takes subtle, so I need to work at keeping the nymphs quiet and drifting naturally so that I could detect subtle changes in the sighter. Once I worked things out I was catching fish pretty regularly and the strongly healthy fish in the run put quite a bend in my short 3 wt! One of the things I love about fishing "The Run" is the fact that I always find wild fish. This particular morning I landed a few tiny wild rainbows and a nice wild brown. It was a fantastic couple of days on the run and the afternoon on the Letort was one to remember thanks to Neil (check back for the next post in a few days). I love the lyrics of hymns, the good ones have a way to stating the truth in a way that is both beautiful and profound. The lyrics below are from one of my favorite Easter hymns that describes how the resurrection of Christ from the tomb changes everything! Wishing you and wonderful Easter everyone! Earth and heaven in chorus say. I haven’t been fishing very much this past winter. There have been a few trips to the Adirondacks to ski in the backcountry. Winter skiing is a good way to identify potential streams to explore when things thaw out. 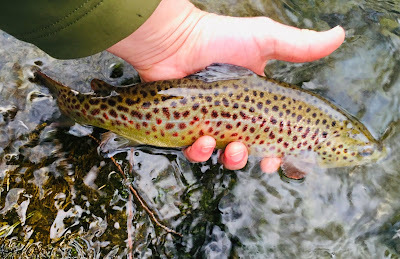 This past week I had the chance to fish in PA for a few hours before driving home after dropping my daughter off at college after her spring break. Late Sunday afternoon I took a walk along the Yellow Breeches. 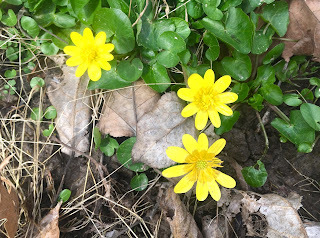 The first of the lesser celandine were just starting to bloom. It won’t be long before the banks are blanketed in yellow. The recent rain had the river quite high. While the Breeches never looks “angry” to me, the volume of water being pushed along can make wading very treacherous as I found out last spring. So with a healthy dose of respect, my plan for the next morning would have to be “The Run” in Boiling Springs; a small feeder stream that flows out of Children’s Lake and into the Breeches. “The Run” was higher than I’ve seen it previously but still safe to fish and very clear. In the first riffle I fished, I connected with a nice wild brown that put quite a bend in my short 3 wt. 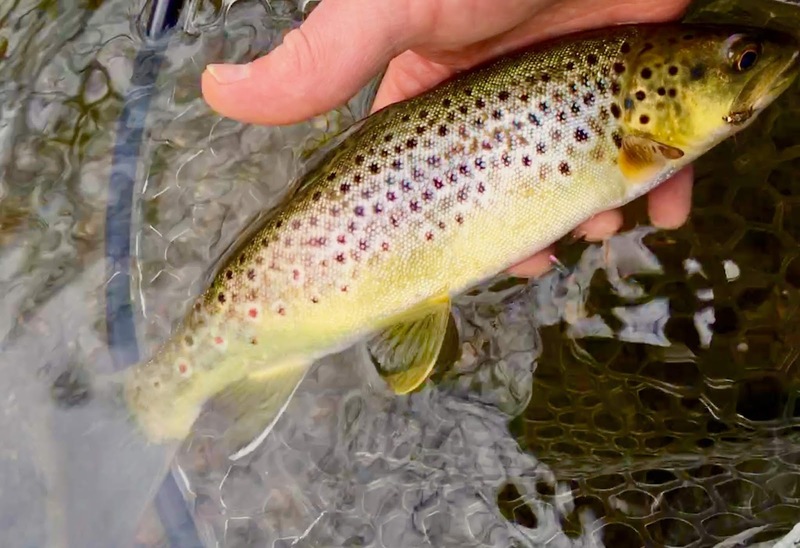 It was nice to feel the tug of a good fish again and to have the first fish of the year be a wild brown. In three of the four riffles that I concentrated on, I found fish willing to take a bead head nymph (#16 soft hackle pheasant tail, #16 soft hackle hare’s ear, and a #18 flash back pheasant tail). 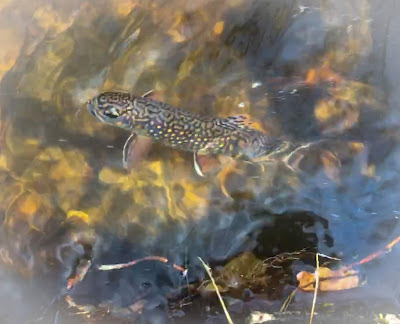 I was fishing a modified tight line leader on a 6’6” 3 wt which worked out well for this small stream. 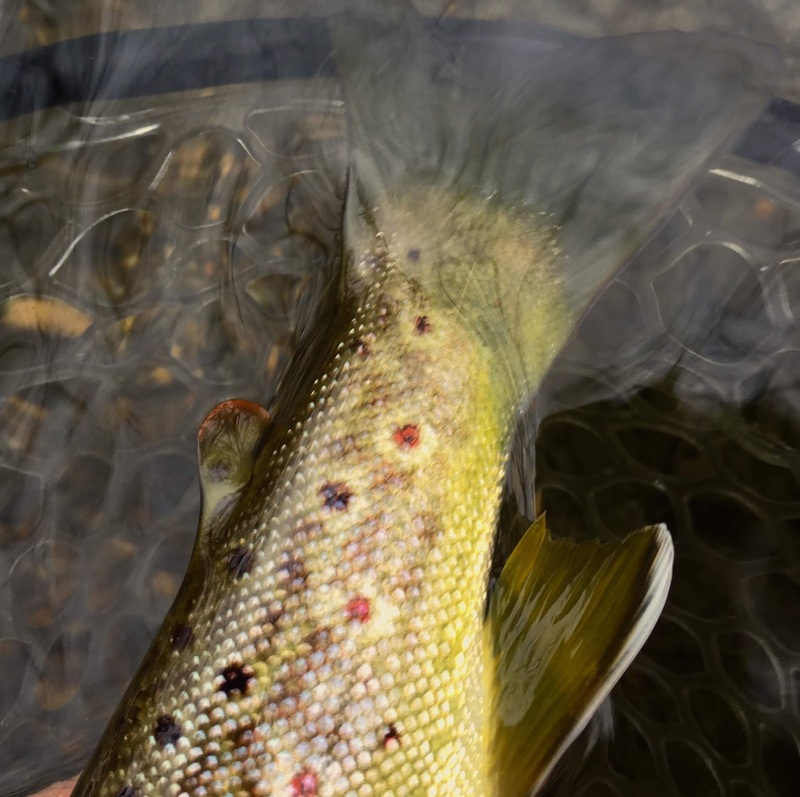 Fish were holding in the riffles and generally could be spotted. Sight fishing is not something I often have the opportunity to do. It was a great morning to be out again, and as the rain started to move in, I packed up and started on the long trip home happy to have had a few hours of great fishing! Another of my favorite winter flies is the Ausable Ugly by Richard Garfield, a native of the Adriondacks. 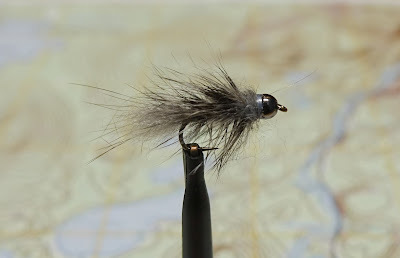 I have a particular love for flies designed for the high gradient waters of the Adirondacks. I've been fishing the "Ugly" for a few years and often pull it out of the box when I need a heavy nymph/streamer to fish in the late winter or anytime the water is up after good rain. 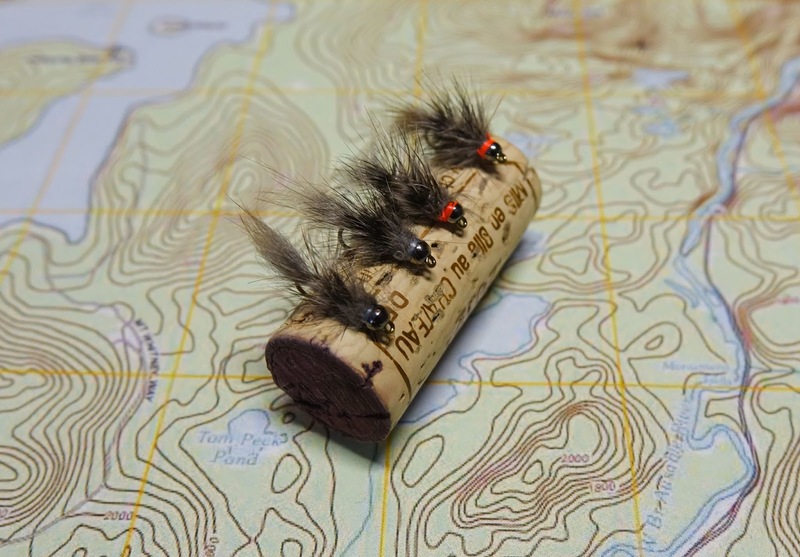 Like the picket pin, it can be fished as a nymph, or retrieved like a mini streamer. You will notice that I added a fire orange thread hot spot on two just to experiment. Rough it up with a wire brush or velcro when finished, it's supposed to be ugly!